Now that it is December I wanted to find out how nearby places are decorated for the holidays. Recently I went to Williamsburg to get an idea of how someplace set in the past would be decorated. It was very simple and many of the wreaths and other displays included fruit and flowers. As I walked I saw all of these traditional scenes. 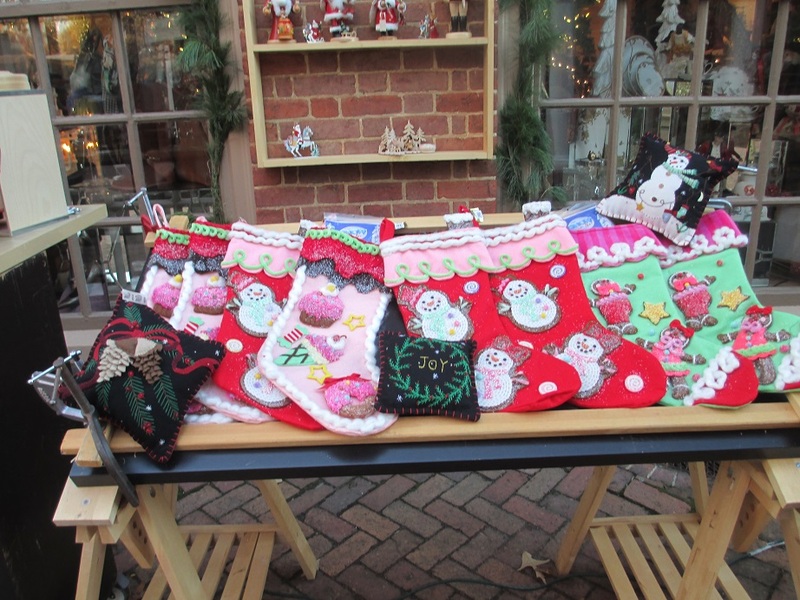 In addition to Colonial Williamsburg there are other parts of town with shopping areas and they also had charming decorations and displays. This was the perfect time for a hot chocolate and a leisurely walk! 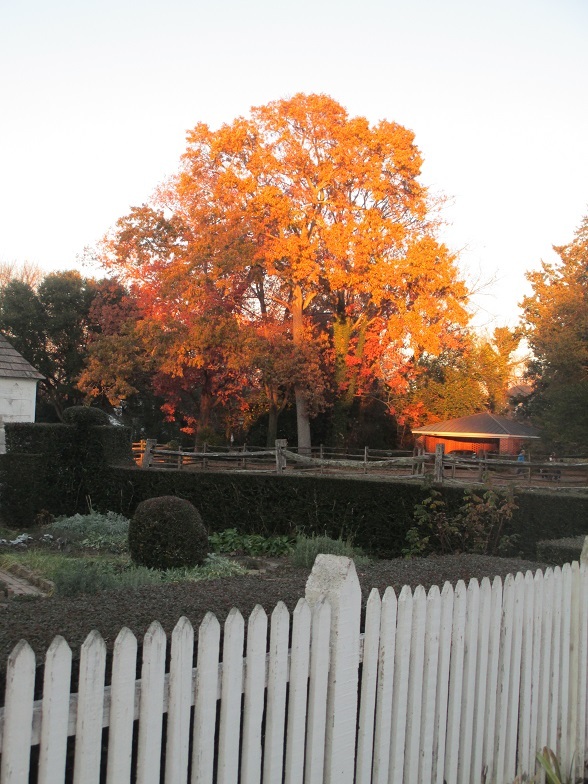 Even though it’s December there are still brightly colored leaves like these in the late afternoon sun. This entry was posted in Travel, USA, Williamsburg and tagged Christmas, decorations, holidays, Virginia. Bookmark the permalink. A marvellous walk – thank you for inviting me to join you! Thanks and I’m really happy that you came along on this walk! Thank you Kamila and I hope that you have a very Merry Christmas! Thanks Bea – I thought that the decorations were charming! Might be time to put your frosty pine cone header on your blog again. That is one of my favorite holiday pictures! That’s weird. When I first clicked on your blog, it had a different header (the one of the buildings) and now the sparkly cones are back almost instantly (beautiful for Christmas). I have a random selection for the header so it keeps changing the picture – I can see why that could be confusing… :) I may just use the pine cone picture for now! It would be very nice for the Christmas season. I just changed it – thanks for the great suggestion! Thank you – I thought the tree was just dazzling, especially in December! That’s what I thought too Suzanne – everything was really lovely! Such bright and cheery decorations – thanks for sharing! Lovely to see all the natural decorations. If the fruit is real, how do they keep the birds and squirrels from eating it? I liked them too Jo – the white fences make a perfect backdrop for the different decorations! I agree – it was very distinctive and I thought it was quite festive! Nice to see these pretty pictures this time of the year. Happy Holidays to you, Meg! I think that’s one of the reasons why I wanted to see these decorations – they were simple, classic and in keeping with the holidays! What lovely photographs. Such charm and simple elegance. The colors are just magnificent. You have put me in the Holiday spirit. Best wishes to you during this most magical time of the year! Thank you so much! The scenes here were simply lovely. I hope that your holidays are wonderful! Yes! I’ve been fortunate enough to experience Williamsburg at Christmas too. It is so lovely! It’s really a wonderful experience and I think it may become a place that I’ll visit every December! 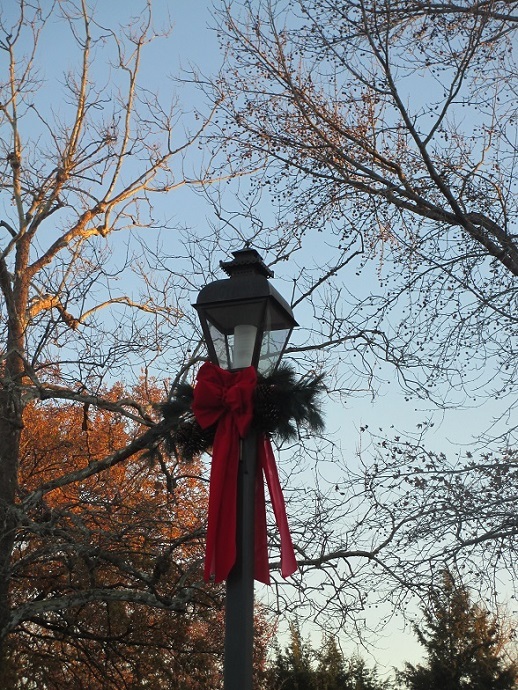 You live in a beautiful area, I just love the fruit in the wreaths and the ribbon on the street lamp. I’ve really enjoyed seeing everything here – it’s been such a picturesque holiday season! I’ve always wanted to see Colonial Williamsburg decorated at Christmas. Thanks for sharing and maybe one day I’ll get to experience it first hand. Thanks Kathryn and Happy Holidays to you! Thank you and a very Merry Christmas to you! Thanks – I thought it was very festive!